This sky map shows the location of the canine constellation, the Hunting Dogs, as it appears near the Big Dipper and other nearby star patterns in the May 2011 evening sky. Soaring high in the eastern sky and almost overhead at around 10 p.m. local time this week are the two stars marking the Hunting Dogs constellation. Known officially as Canes Venatici, the Hunting Dogs are currently visible, weather permitting, a third of the way from the end of the Big Dipper's handle and below it. These cosmic dogs were placed in the sky to assist another constellation — Boötes, the Bear Driver — in his daily task of pursuing the Big Bear (Ursa Major) around the pole of the heavens. Unlike the star patterns of Canis Major and Canis Minor, which are the two faithful canine companions of Orion the Hunter and are considered separate constellations in and of themselves, the Hunting Dogs of Boötes are considered to be single constellation (hence the plural "Canes" as opposed to the singular "Canis"). The sky map of the Hunting Dogs constellation here shows its location near Boötes and the Big Dipper, which is part of the Ursa Major star patterm. Of the two stars that mark the Hunting Dogs, the brightest is Cor Caroli, which is also known as "the Heart of Charles." A popular story is that the star was so-named by Edmund Halley in honor of King Charles II of England. However, upon delving deeper into this star's history, it is found that this star’s original name was "Cor Caroli Regis Martyris," honoring the executed Charles I. Cor Caroli marks the position of "Chara," one of the two hunting dogs in the mythological outline of the constellation. The other dog is named "Asterion" and is marked by the other, fainter star. 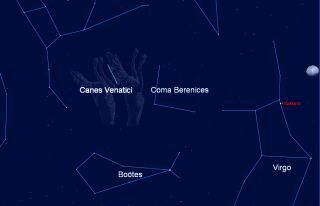 There are two objects in Canes Venatici that are worth looking for. The first is a beautiful and bright globular cluster, thought by many to be one of the most splendid in the sky. It was first seen by Charles Messier in 1764 and was listed as number three in his famous catalogue of deep-sky objects. In a good pair of binoculars, M3 looks like a fuzzy 6th magnitude star. But with a small telescope it appears as a circular, nebulous object. Larger instruments will bring out the cluster’s full glory: a beautiful ball of tiny countless star images, with streams of stars seemingly running out from all sides. Perhaps 40,000 light-years away, the cluster's diameter is estimated to be 220 light-years across. The other object, also discovered by Messier in October 1773, is M51. Not a cluster of stars, but one of the nearest and brightest galaxies relative to our own. This was also the very first galaxy to show a spiral form and hence has come to be known as the "Whirlpool Galaxy." A good pair of binoculars will show it as a faint patch of light, whose total magnitude is about eight. Unfortunately, you will need a telescope of at least eight-inch aperture if you hope to get a glimpse of this galaxy's spiral arms. Many years ago, under a very dark and clear sky near Southold, Long Island in New York, I was able to readily discern the spiral coils of M51 using a 10.1-inch Dobsonian reflector. There is also a much smaller satellite galaxy, NGC 5195, that appears just off the end of one of the spiral arms of M51. When you are gazing at this entire star system, keep in mind that you are looking out into space to a distance of some 35 million light years. That's amazing enough … but an even more amazing realm awaits your view off toward the south. Cor Caroli is the faintest of four stars that comprise a large diamond frame that can be found high in our current evening sky. The other stars in the diamond are Denebola (marking the tail of Leo, the Lion), Arcturus (in Boötes) and Spica (the spike of wheat in the hand of Virgo). Astronomy popularizer Hans A. Rey called it the "Virgin's Diamond," though others refer to it simply as "The Great Diamond." In 2011, we also have an interloper within the Diamond: the planet Saturn, which is positioned along the imaginary line connecting Spica to Denebola. At first glance, The Great Diamond appears to encompass a rather dull region of the sky. The Diamond itself appears about as wide as the Big Dipper and about twice as long. In the upper right part of the Diamond is the faint fuzz of stars belonging to Coma Berenices (Berenice's Hair). But also located within the Diamond is one of the most remarkable areas of the heavens. Sometimes called the Coma-Virgo Cloud of Galaxies or the “Realm of the Galaxies” (older astronomy texts referred to it as "The Field of the Nebulae"), here lies a veritable treasure trove of numerous star cities. Thousands of galaxies have been photographed here with great observatory instruments. If you own a good reflecting telescope of at least 6-inch aperture or greater, a sweep of this region will reveal literally dozens of these galaxies appearing as nothing more than a myriad of faint and fuzzy patches of light. This is the only great cloud of galaxies that is available to the average amateur. Just try to remember that each and every one of these dim blobs is a star city, which likely contains tens of billions of stars! And keep in mind that this cluster or cloud of galaxies is only the nearest of the large aggregations of galaxies relative to our own. The best estimates indicate that it is located somewhere between 40 and 70 million light-years from us. So it is possible that as you run across these pale little patches of light in your telescope, irregularly shaped, round or elongated in appearance, that you are gazing upon galaxies whose light may have started toward the Earth around the time of the extinction of the dinosaurs!